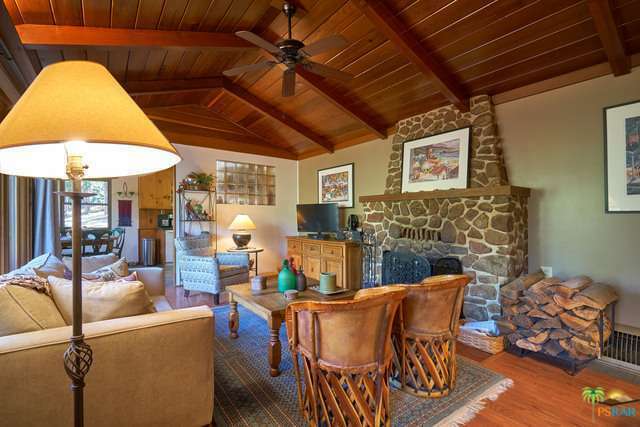 This is the Idyllwild "cabin charmer" the town is known for and buyer's always have at the top of their want list. Impeccability maintained and upgraded. Approximately $60,000 on improvements including new roof, Heater, Anderson Windows, 8000W Genrac Generator (so you'll always have power when others don't), new kitchen including quartz counters and much more! A complete upgrade list is available for interested buyers. Views of Lilly Rock and the surrounding valley thrive from this - "breath of fresh air" mountain home. Oversized lot with mature trees and privacy. Lots of outdoor decks for entertaining, "Dutch" door leading into the home, beautiful hand-crafted rock fireplaces and handsome wood work throughout. "Mile-high Idyllwild" is a popular Southern California mountain resort about one mile (1.6 km) in altitude. This enchanting home, second home or investment property is now available for discriminating buyers?